Should You Report Fishing Violators? 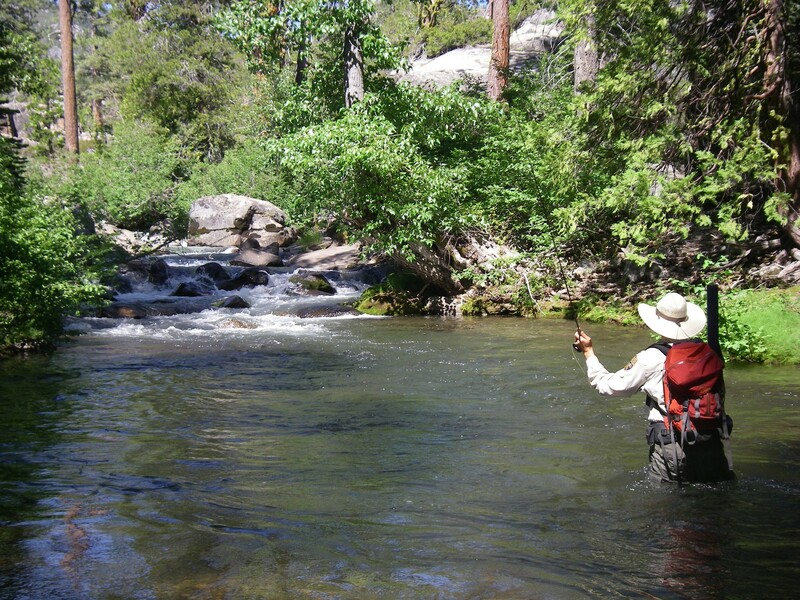 DFG Fisheries Biologist Jeff Weaver fly fishing on Caples Creek. Answer: If you see violations in progress or know of people who are repeatedly breaking the law, I encourage you to use the Department of Fish and Game (DFG) CALTIP line (888-DFG-CALTIP) or else call your local sheriff’s office which can get the word to dispatch operators to locate a game warden. The more information you can provide as to descriptions of the individuals, vehicle descriptions and license plate numbers, observations of the activities, etc., the better the chance that law enforcement can find the individuals who are not in compliance with the law and cite them for their violations. As far as whether you should approach the anglers or not, I would consider your own safety first and make your decision based on that. If the people obviously don’t know they are doing something wrong, then they may appreciate your insight. Otherwise, best to report the violations and leave it to the game wardens to hopefully take care of the situation. Answer: Sorry, but while this might sound like a great idea, donated fish cannot be claimed as a tax deduction because you cannot assign a value to sport-caught fish. The best thing for anglers to do is to catch and keep only what they know they will actually use so that they don’t end up with excess fish. Answer: If you’ll be hunting in “Condor Country” and the non-lead ammunition you will be carrying cannot be easily identified as non-lead, the best thing to do is to carry the box end with you (or the whole box) to show to a warden should you get contacted in the field. If you’re thinking the ammo looks alarmingly like lead, we may also! It’s a good idea to make sure that any commercially loaded ammunition, or bullets for handloading, purchased for use in the lead-free zone is on the certified lead-free ammunition approved list found on our Web site at www.dfg.ca.gov/wildlife/hunting/condor/certifiedammo.html. This site is updated periodically so check often. According to Hunter Education Instructor Blaine Nickens, the listed lead-free ammunition from major cartridge manufacturers can usually be found in sporting goods stores in and adjacent to the lead-free zone. There are also small vendors on the certified-ammo list and online vendor sources for the major commercial offerings that can be mail-ordered if you do not live in the vicinity of the condor lead-free zone. In addition, if you have no evidence that your ammo is compliant with the non-lead ruling in that area and the game warden thinks it necessary, the warden can take a sample of your ammo for testing. More information about hunting in this lead-free area is available online at www.dfg.ca.gov/wildlife/hunting/condor. Answer: No, you do not have to take another hunter education course as long as you can show your certificate proving that you have taken an approved course in the past. In California, we accept hunter education certificates from the other states. However, Lt. James Kasper from DFG’s Hunter Education program recommends that everyone should periodically update their knowledge with a refresher course and the 10 commandments of handling a firearm. Our hunter education program is always improving and most people do benefit from a refresher. This entry was posted in Bag Limits/ Possession, Catch & Release, Firearms/Ammunition, Fishing, Licensing/Permits/Stamps/Report Cards, Regulations and tagged firearms, hunting. Bookmark the permalink.